This week on ‘The Writing Life of:‘ I am thrilled to be interviewing author Jaimie Admans. 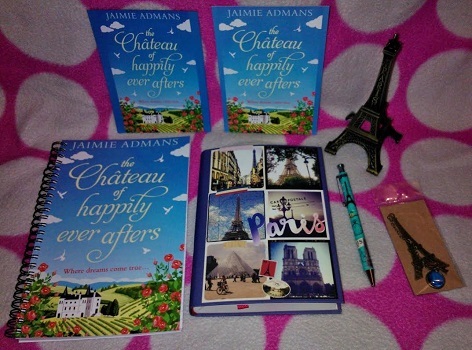 Jaimie will be sharing with us detail of her writing life, telling us all about her latest book ‘The Chateau of Happily Ever After’, which was released on 7th June 2017, and answering a few fun questions too. Jaimie is a 32-year-old English-sounding Welsh girl with an awkward-to-spell name. She lives in South Wales and enjoys writing, gardening, watching horror movies, and drinking tea, although she’s seriously considering marrying her coffee machine. She loves autumn and winter, and singing songs from musicals despite the fact she’s got the voice of a dying hyena. She hates spiders, hot weather, and cheese & onion crisps. She spends far too much time on Twitter and owns too many pairs of boots. Jaimie is the author of chick-lit romantic comedies The Chateau of Happily Ever Afters and Kismetology, and she has also written young-adult romantic comedies Afterlife Academy, Not Pretty Enough, and North Pole Reform School. A writer! There was never anything else I could see myself doing. I was terrible in school, I had no clear interests and nothing that I wanted to follow as a career path. Nothing appealed to me except writing. Judy Blume is amazing. Her books were my absolute favourites, I read them over and over again when I was younger. I also grew up on Enid Blyton and Virginia Andrews, Point Horror and Point Romance books, and generally anything I could get my hands on at the local library! From really early on. I remember reading Judy Blume books in primary school and wondering how people got to write books like that. I was always writing stories or poetry. I can remember my first ‘I want to tell this story’ moment when I was fifteen, so really from then onwards, although it got put to one side for a few years in favour of a ‘proper’ job, I was about twenty when I started writing again, and probably twenty-five when I wrote my first romantic comedy and decided that was what I wanted to write! I self-published my first few books, which did okay and got great reviews, but it wasn’t enough for me. I stopped self-publishing and started hunting for an agent, but I got lucky and was offered a contract with Carina for a novella I’d entered into a competition before many agent rejections came in, so that became my priority. Now Carina have re-branded as HQ Digital and they very kindly wanted to publish this book too, which is my first full-length novel with them! It really depends on what I’m doing, because it’s not always writing a first draft, sometimes I’m editing or researching or planning, or doing promo work. On a typical day of actually writing a book, I’m not happy if I do anything less than 2000 words a day, I’ll aim for 3000 but anything over 2000 is fine. I’m not a morning person so I try to be on the computer by about 11am, then I write until lunchtime at 3pm, then again until about 8pm in the night, and I like writing at night, so I’ll often go back about 11pm and continue until 2am/3am in the mornings if I haven’t made my word count for the day or if I’m just really into the story and don’t want to tear myself away from it! No, never. I sometimes wonder if I should have, but it was natural to use my own name, even though there have been a couple of times I wished I hadn’t! I have lucky armwarmers and I wear them to write the first chapter! It comes from doing NaNoWriMo for quite a few years – I’d always start at midnight on October 31st, so it’s cold then, and just before my very first NaNo, I’d bought these rainbow striped armwarmers, so I put them on, and it just became a tradition. Every NaNoWriMo, I’d be at my computer ready to start writing at midnight on October 31st in these armwarmers, and it kind-of spilled over into every other book too. Now I start every book in my lucky armwarmers, then I take them off and don’t wear them again until the next book! I’m on a laptop which is plugged in on my desk because I don’t trust the battery not to die halfway through a scene! I don’t really write on anything else. Sometimes I’ll take my little old netbook to the treadmill or the sofa (let’s be honest, it’s usually the sofa!) but generally I just write at my desk on a laptop! I have loads of unpublished work, much more unpublished than published, but I firmly believe that no story is ever wasted, and one day those unpublished books will find a home. As for how many books I’ve written, including all unpublished manuscripts and the absolutely dire early rambling stories that will never see the light of day, The Chateau of Happily Ever Afters was my seventh published work, and overall my sixteenth complete novel, not including a couple of novellas and half-finished drafts! A bit of both. I have to know where a book is going. I need to know the beginning and the end, and generally a few points in the middle, but I like to leave plenty of room for the characters to write themselves, and they often do things that I don’t plan on, and that’s the best part so I just let them get on with it! I like a loose outline, and now I’ve got my editor to answer to, I have to write a synopsis beforehand, but it’s always vague, and I find that’s what works best for me. I do read all reviews, even though I probably shouldn’t! I don’t mind bad reviews because everyone is entitled to their opinion, and I don’t expect everyone to like something just because I like it. I also think you can often learn from bad reviews – hearing what someone didn’t like about your book is often more helpful than hearing what people did like about it. Don’t get me wrong, it’s never nice to see someone trashing something that you’ve worked hard on, but everyone likes different things, and the thoughtful reviews that constructively point out where they think you’re going wrong are often worth taking on board. Wendy Clayton stopped believing in fairy tales a long time ago. Instead, she has a ‘nice’ life. Nice job. Nice flat. Absolutely no men. Until her life is turned upside-down when her elderly neighbour, Eulalie, passes away and leaves her the Château of Happily Ever Afters! Roughly a year. I first started thinking about this idea in June 2016, sent the synopsis off to my editor in July 2016, started writing in August and handed in the first draft by Christmas. Revisions took until April, and the final publication date will be in June 2017.
,P.It probably would’ve been earlier, but as this is a summer-y book, it needed to be released in the summer, so I’ve been pretty lucky with long deadlines because publication was a while away. I read through baby name books and websites, and usually a name will jump out for each character. Usually they just appear in my head with a name already there, but if they don’t or if I can’t use the name for some reason, I trawl baby name websites waiting to scroll past a name that just clicks! The main character is Wendy who, after having her heart broken and her money stolen by a conman, now lives her life in a very safe routine, and the story starts when Wendy finds out that she’s inherited a huge chateau in France. It’s about a million miles away from her comfort zone, and the story is really about Wendy stepping out of the comfortable routine she’s used to keep herself safe for years and going to visit this chateau, and the problems that arise when she finds out that she’s not the only person who’s inherited it. The end. It’s always the end for me because by the time I get there, these characters have become like friends, and writing the end means I’ll have to say goodbye to them for a while, so I put off writing it! I also feel a responsibility to them, like I’ve put them through turmoil in the book, they deserve a happy ending and an ending that does justice to their story, and I always feel like I’m going to let them down, so I struggle with endings. Maybe I just shouldn’t get so attached to my characters! This one named itself. It was just kind-of there. The elderly neighbour who left the chateau to Wendy believed that the building would help anyone who lived there find love, and The Chateau of Happily Ever Afters is what she had always called it when telling Wendy about it, so it was just the obvious title for the book. That’s the thing with titles – sometimes they’re easy, and sometimes they’re really, really difficult! Either they’re there instantly, or it’s like pulling teeth trying to come up with something that fits! My mum read it at the same time it went off to the publisher, and she’s extremely proud that the issues she pointed out are the exact issues my editor pointed out in the revisions stage! My mum now thinks this qualifies her for a top job in a London publishers! I had a novella published by the publisher in 2015, and there’s a clause in the contract that means they get first refusal of my next work, so I sent that in last year, and although they turned that one down, they did ask me to write something else for them. We agreed on a synopsis before I started writing, I then wrote the first few chapters and sent them in, and I got a very exciting phone call a few days later saying they wanted to publish the book! It was about 4am so I went to bed! How rock n roll is that?! I’m currently writing my next book for HQ Digital, it hasn’t got a title yet but it’s another romantic comedy and will be released in March 2018! Chocolate! As evidenced by my expanding waistline! Or cake… Or maybe ice cream… You can see why I need to go on a diet, can’t you?! Red! I wouldn’t even say it’s my favourite colour, but I always go for red things! Legally Blonde and Clueless are two of my favourites, I watch them any time they’re on TV, but generally I could watch most films over and over again, particularly Christmas movies – I watch the same ones every year! It changes, but probably something from a musical. Seasons of Love from Rent or Do You Hear the People Sing from Les Mis would be pretty near the top! Celebratory cake! Um, quickly followed by a new house and a round-the-world travelling ticket! You can find out more about Jaimie by visiting the website/social media sites below. I would like to say a big thank you to Jaimie Admans for sharing with us details of her writing life, and for a wonderful interview. Thank you for having me again! Great questions too, I really enjoyed answering them! The talking duck one gave me such a good laugh!